You guys may have noticed that I haven’t posted much on my ebook reading device or reviewed any ebooks lately. This is because I’m a little disillusioned with ebook readers. I find my Sony PRS-T1 slow (relative to all my other gadgets), and I’ve found that my reading style isn’t exactly suited to ebook readers. For one, it’s an effort to kill a fairy. I also remember passages and plot events based on how they look on a page—in print. I lose that visual reference when reading ebooks and, together with the slow speed of skimming, the experience can get frustrating, particularly if I’m not totally sold on the story I’m reading. So I’ve been thinking that I need to buy a new ebook reader, and given that I’ve had two Sony models, I’m leaning towards the Kindle. Most people I know who read ebooks have one, and most of them are happy with it. But then I saw the new Sony and I have to admit…I’m tempted! The Evernote integration would fit in very well with my main use of an ebook reader—to read ebook review copies. The note-taking capability of the Sony was what ultimately sold me on the device, but I’ve found it cumbersome to use—in fact, I found that the T1 was more awkward to use for note-taking than the smaller, earlier model PRS-350 (Pocket Edition). I’m wondering if using Evernote on an eInk device would improve the experience significantly. I also prefer touchscreen, but again, eInk is relatively slow to respond compared with every other gadgety thing I have, so I’m not sure it’s much of an advantage over a keyboard or trackball or whatever. Sony also supports library lending, but unfortunately, my library still hasn’t implemented this service, so it’s pretty useless to me at the moment. Anyway, I wanted to ask you guys if you’ve tried the Sony PRS-T2 and what you thought of it? 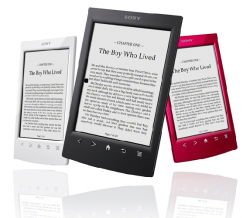 And for those of you who have tried different ebook readers, which do you prefer between the Kindle and the Sony, and why? Tagged reading devices, sony reader. I decided to get away from e-ink all together and went with a Kobo. I don’t find I have an issue with screen glare and I can use apps for the different proprietary formats. Its not been without its issues but for a hundred dollars more I also have a movie player.